Chulalongkorn University political science lecturer and public Marxist, Adjarn Giles Ji Ungpakorn is one of the leaders of the September 19th Organization and led the first protest against The Council for Democratic Reform under Constitutional Monarchy last Friday, September 22. Ungpakorn was born into one of the many military junta’s that checker Thailand’s history in the 1950’s and went to high school in Thailand, later attending university in Britian. Growing up in Thailand he was forced to answer that democracy still stood strong during exams despite military presence. “There was a military dictatorship but we had to answer that Thailand was a democracy,” Ungpakorn recalled concerning his Thai citizenship classes. Thailand was considered a democracy despite the present military dictatorship that roamed the streets. Military juntas have been overturned twice in the past 60 years, 1973 and more recently in 1992, the most recent military junta in Thailand. Ungpakorn’s father was Rector of Thammasat University in 1973 during the political uprising of students against the military that resulted in countless brutal deaths and his immediate exile from Thailand. A few hours after opening fire on peaceful protestors the military followed him to the airport in hopes of publicly executing him before he left the country. The September 19th Organization clearly states that they were not in support of recently ousted PM Thaksin Shinawatra and would have remedied the situation by means of motion through the legislator. “If you think Thaksin is corrupt you should use the law against him. 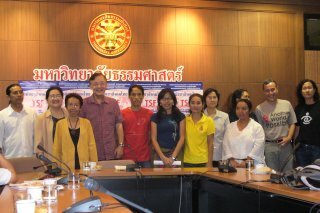 If you think the court is corrupt you should use the law against them,” said Ungpakorn. Unfortunately corruption breeds fear and fearful people are not always willing to indict those whom hold the power. “If we don’t do anything soon, they will appoint a military leader,” said Ungpakorn, “This will be far worse than Thaksin.” A military leader will ultimately result in the people being cut out of the constitution and isolated from any freedom of speech. PM Thaksin won the hearts of many people in rural Thailand by instating cheap universal healthcare and creating a village fund that had the Bank of Thailand issue 1 million baht to countless villages throughout the country. Many supporters of the coup insist that this abuse of government funds and bribing of votes made Thaksin too powerful for indictments to be issued. “In the past there has been much buying of votes in Thailand,” said Ungpakorn. “Every single party has bought votes.” Yet, no matter how gross the corruption, nothing can come close to the “major setback in democracy” that took place on the night of September 19. “Every military junta states they will return power to the people,” said Ungpakorn. By striping the people of their democratic rights the military has become a dictatorship and returning power is never a quick or easy process under such conditions. “You cannot establish democracy by destroying it,” said Ungpakorn in his closing statement. Protests have been planned on the Chulalongkorn campus October 4, exactly two weeks after the military promised a government would be put into place, and on October 6 at 5pm on the main grounds of Thammasat University.